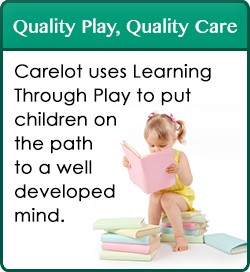 Carelot Children’s Centers and Carelot Clubhouses are extremely proud of the high standards that we hold our staff to. Our educational team is made up of individuals with several levels of degrees in early childhood education and related fields from Masters to Associates. In addition, all of our staff continues their personal education as they work with us. Education is continued both at the collegiate level and thorough trainings offered both by our consultants and administrators. In addition, our team receives annual trainings from industry recognized leaders in specific fields and on specific topics to allow them to grow and flourish as educators. Our team is a family of caring nurturing individuals that hold certifications in First Aid, CPR, and Medication Administration. Our family atmosphere cultivates an environment where our staff enjoys long careers and has opportunities for advancement. This creates loyalty to the field as well as our families. Our executive team has more than 50 years of combined experience in the field of early childhood education and business administration. In conjunction with a team of consultants that include a registered nurse, education consultant, social services consultant and dental consultant. This team works to develop the curriculum and oversee the programs that strive to meet and exceed the requirements of the Department of Health, National Association for the Education of Young Children and the polices set forth by the company.